Storm Damage Repair Peoria, IL | Kelley Construction Contractors, Inc.
Storms can damage your property in a number of unexpected ways. Hail can destroy shingles on your roof, or puncture glass windows. Heavy snow can cause sheds and garages to collapse, while tornadoes and lightning can lead to fires or structural damage. Each of these emergencies has two things in common: first, they tend to come unexpectedly to our customers in Peoria, Pekin, Bloomington, and throughout Central Illinois; and second, they can leave property owners with huge logistical headaches. That’s because coordinating with insurance adjusters to arrange for necessary repairs can be difficult and time-consuming. And then, it’s necessary to find a good storm damage restoration team to put your property back into like-new condition. Before we provide any repairs or solutions, we always like to provide storm damage inspections during which we take a close look at all areas of your property: roofing, siding, gutters, windows, doors, decking, etc. Our experts have trained eyes to find even the most minuscule damage. Once we have conducted a thorough inspection, we will provide you with an estimate for repair costs. We can even help you through the insurance process if you have coverage. If your property has been affected by any natural disaster, start with a storm damage inspection from Kelley Construction Contractors, Inc.
At Kelley Construction Contractors, Inc., we want to be your only call when a disaster strikes. We even have emergency crews available if you are in an urgent situation. 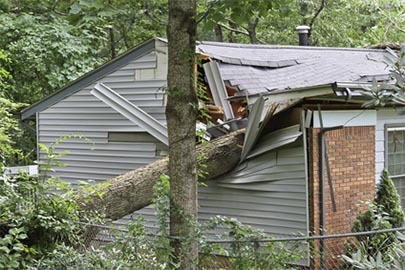 From assessments to restorations, we can take care of everything related to your property’s storm damage. If you live in the Peoria metro or surrounding areas and have lingering storm damage, contact us immediately.